"Bear Country. Largest group of life-size mounted bear ever photographed at one time - 24 in all - count them. Taxidermy by Knopp Brothers Taxidermy Studios. Complete planning, booking and travel service to anywhere in the world for any game animals. " 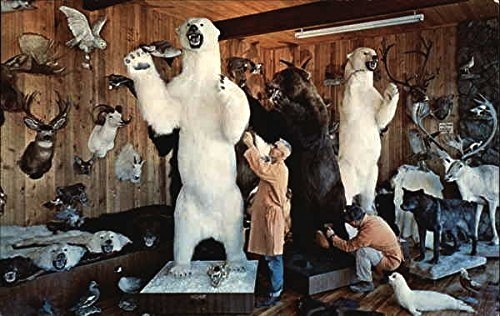 "At Knopp Brothers modern taxidermy studios, part of the competent staff of master taxidermists are shown giving the final touches to beautiful giant Alaskan Polar and Kodiak bears. Knopp Brothers Studios specialize in mounting lifesize animals, game heads and fur rugs." "The lifetime experience of the exciting hunt will never be forgotten with these beautifully mounted Alaskan Polar and Brown Bears. 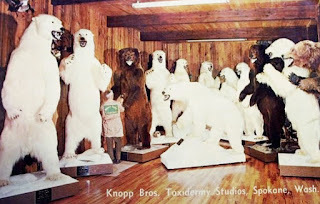 Knopp Brothers are one of the world's leading taxidermists specializing in mounting lifesize animals, heads, and rugs. Knopp Brothers offer free guide and hunting information."